Raspberry Pi is the 3rd best-selling general-purpose computer platform, trailing only the Microsoft® Windows® PC and Apple® Macintosh®, with over 12.5 million sold as of 2017. The secrets to its success are in price, performance, and flexibility. For $35 the Raspberry Pi 3 Model B+ offers a 64-bit quad-core ARM processor, gigabit ethernet, wireless, Bluetooth™, 4 USB ports, micro SD slot, and HDMI output. The power and capabilities of the Raspberry Pi is starting to be leveraged widely across industry, including by Measurement Computing where it is integrated into the design of its WebDAQ Series of data loggers. With the Raspberry Pi Compute Module 3 and a data acquisition device, MCC created the high performance WebDAQ 504 acoustic/vibration logger which acquires and logs 4 channels of 24-bit data, performs an FFT on all 4 channels, and displays the data to the user from a responsive web server. The success of the Raspberry Pi in processor intensive, professional engineering applications such as this demonstrates why it is now being considered as an OEM option for industrial designs. The MCC 118 is a 12-bit, high-speed 8-channel HAT addon board for voltage measurement. Over the years, individuals have published open-source designs and small companies have sold low-cost HATs for a variety of tasks, including support for analog and digital I/O. These designs and products are adequate for the education and hobbyist/maker market but have some serious short comings for professional Test and Measurement applications. Most of these devices are provided partially assembled, without specifications or programming support. UL for Linux is an open source, easy-to-use library with a structure similar to MCC’s Windows offering (Universal Library). 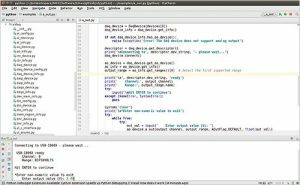 UL for Linux is an open-source Linux library which supports our most popular USB devices and provides a programming interface for both Python™ and C/C++®. This library is verified on multiple Linux distributions including Raspbian®, the distribution most popular on Raspberry Pi computers. 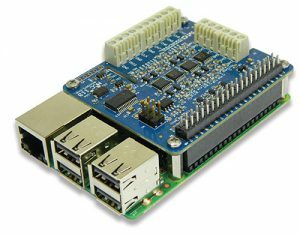 UL for Linux and MCC’s wide selection of USB DAQ devices, greatly expands the capabilities of the Raspberry Pi computer. MCC’s family of HATs are specifically for the Test and Measurement and OEM/ODM markets. MCC DAQ HATs come with high-quality SW libraries that support Python™ and C/C++® to facilitate quick and easy development. Like all MCC products, the DAQ HATS are designed in the USA, use parts sourced through proven distributors, are fully tested and come with a 30-day money back guarantee and a 1-year warranty. The MCC 152 provides two 12-bit analog outputs along with eight 5 V or 3.3 V DIO channels enabling the creation of a full multifunction Raspberry Pi measurement and control system. This product will be available in Q4 2018. Do you have anything that runs on the BeagleBone Black? Can the MCC be adapted to the BeagleBone Black since it runs embedded LabView which runs MCC library drivers? Using the UL for Linux library, many MCC devices can work on BeagleBone Black. Please see https://www.mccdaq.com/daq-software/Ul-for-Linux-Support.aspx for more details. The Raspberry Pi HATs will only run on their native platform. How about a 24 bit (2400 dual ADC, not too fast, say 5 samples/sec? Should be easy-peasy.